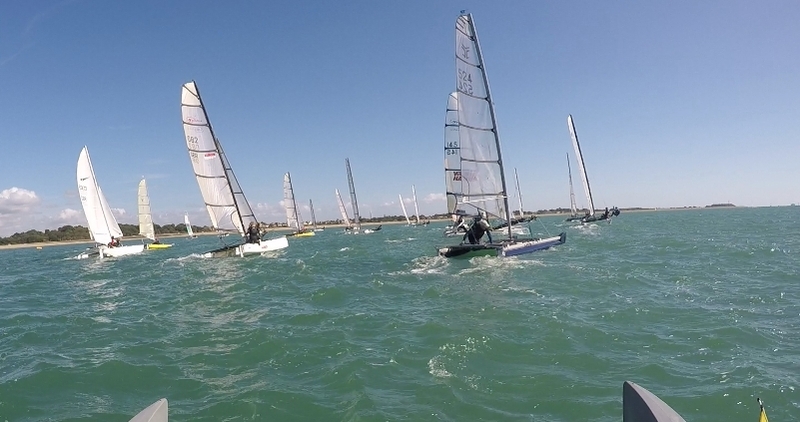 A small Catapult fleet contested the September TT as part of the UKRA Cat Open, at a new venue,Stokes Bay SC also hosting the Tornado Nationals.The fleets on Saturday faced a fresh to strong SW breeze, with a steep Solent chop under persistent rain. By Race 2, the fleets were diminished by capsizes and withdrawals, and Alastair had a lonely chasing race, enlivened downwind on the first lap, gybing in the steeper chop nearer the shore, and pitch-poling as the bows plunged into the wave ahead. The boat, after a shuddering stop, heaved itself out again, to continue for the second cautious lap. It was clear that the promised easing of the wind and rain was coming no time soon, and the Club called the boats in without the scheduled third race. Alex Montgomerey arrived to a Sunday that was absurdly different, the helms waiting in hot sunshine to see if breeze would arrive; after an hour's delay it came from the SE, filling in as the start was prepared to a light but good racing breeze. Sunshine brought out more boats (the Tornados up to eight, still fewer than the Catapult Nationals) with the Catapults competing in a bigger mixed fleet again over W/L two-lap courses. The tactics revolved around whether to compete for the hectic start (with the Spitfires packed at the starboard end) and then tack away on port out to sea, or drive further down waiting for the faster boats to pass or tack away, along the beach. Race 3 set the pattern of the day, with the Catapults close on the first beat, with Alex gaining gradually, and Syd pulling up over Alastair steadily. Downwind, the temptation to gybe back and forth going dead downwind for the tempoary extra speed was hard to resist. Alex pulled out for a win by 3 minutes, with Syd second. In Race 4 the Catapults stayed on starboard along the beach, with Alex' speed again superior, and Syd clawing back Alastair's initial lead. Alastair caught Syd downwind the boats staying close (photo below) Alex could afford a 360' at the top mark to still defend his second win. 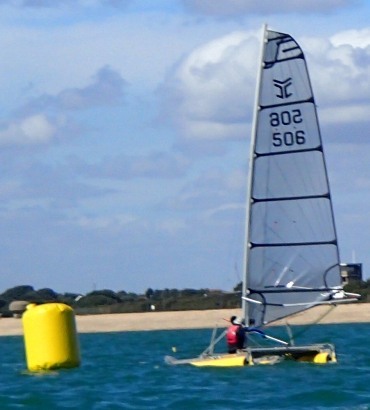 The Race 5 start was disrupted by a chaotic general recall, and Alastair, elected to tack away from the fleet (photo at bottom of page) and gained out to sea, rounding just ahead of Alex, the two running side by side for the next ten minutes until Alex gained enough to round ahead and pull away upwind. Syd again came through to round at the top mark ahead of Alastair, then gybing back and forth defending down the run, but losing a little each time crossing the wind-shadow, staying just ahead (photo right) for the third straight second place.